The amazing chart above shows how the number of active natural gas rigs in the US has fallen from an all-time high of 1,606 in September 2008 to only 407 in early March of this year, a drop of 75% according to data from Baker-Hughes. Meanwhile, EIA data though December 2012 show that US natural gas production has risen to record levels and increased by almost 17% during roughly the same period that active gas rigs dropped by 75%. In about the last five years, the amount of natural gas produced (gross withdrawals) per rig has increased by more than four times. What this means is that the president’s campaign plan to revive America’s labor force with manufacturing employment almost certainly won’t work — leaving aside the fact that it’s also quite poor economic policy to encourage any particular sector, but least of all one that just happens to make people feel warm and patriotic. In fact, while the president’s campaign promised “new jobs,” all we’re seeing … is the restoration of jobs lost in the 2008 recession, to the point where, even if the president’s promise comes true, the U.S. economy would only have as many manufacturing jobs as it did in November of 2008, when manufacturing employment was dropping dramatically — that is, we wouldn’t even have as many manufacturing jobs as we had before the recession. 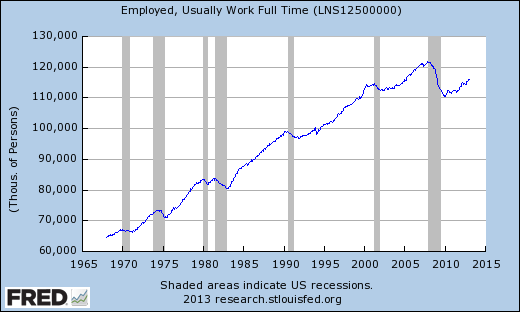 In fact, if Obama succeeds in reviving manufacturing like he promises above, manufacturing employment . . . won’t be revived: By the end of 2016, even if the million jobs are created, manufacturing employment will remain about 9 percent of U.S. private payrolls (if we assume the CBO’s overall payroll projections prove true), which is what it was at the beginning of the recovery. we buy high and sell low…. It is interesting to see how the peak levels of cash holdings seem to correspond to the bottoms of market cycles, and the lowest levels of cash holdings seem to correspond with the top of market cycles. In other words, when stock prices were low, investors were holding on to a lot of cash. As stock prices rose, investors were putting their money back into the market. Indeed, cash holdings were high right after the 1987 crash and steadily declined as the market rallied in the 1990s. They bottomed out almost exactly when the tech bubble burst in early 2000. This appears to be one more manifestation of trend-chasing often exhibited by investors. Indeed, when the survey reports a reduction in cash holdings, the non-cash portion of the portfolio had, on average, much higher returns in the preceding period than in months when the survey reports increases in cash holdings1. In other words, when returns have been good investors reduce their cash holdings and invest more in risky assets, and vice-versa when returns have been poor. That’s a 55 percent drop, for you dinosaurs who still think that is important — and that is just for turbines still working. but as many as 1 in 4 wind turbines just does not work. Some do not even spin. Others spin, but do not generate electricity, so it is hard to tell by looking at them. As many as 4,500 wind turbines have been built — and abandoned — in California alone. The energy revolution already has been transformative in the material states. Between 2010 and 2011, according to an analysis by EMSI, all six of the fastest-growing job classifications were related to energy development. Since 2009 the industry, according to EMSI, has added some 430,000 jobs, with the largest share going to Texas, Oklahoma and Pennsylvania. Perhaps even more important, the expansion of the energy sector is galvanizing manufacturing, hitherto the weakest link in the material boy economy. The energy boom could create more than a million industrial jobs nationwide over the decade both to supply the industry and as a result of lower energy costs, according to a recent PricewaterhouseCoopers study.This new industrial economy is already evident in those parts of the country embracing the energy revolution, notably Texas, Oklahoma, Louisiana, Pennsylvania and Ohio. THE theory of peak oil, the idea that global crude production may be at or near its limit, is based on the work of M. King Hubbert, a geologist working for Shell in the 1950s. His prediction that oil output in the lower 48 states of America would peak by around 1970 has been adopted and expanded by hydrocarbon doomsayers, who reckon that global production has peaked and the world is running out of oil. 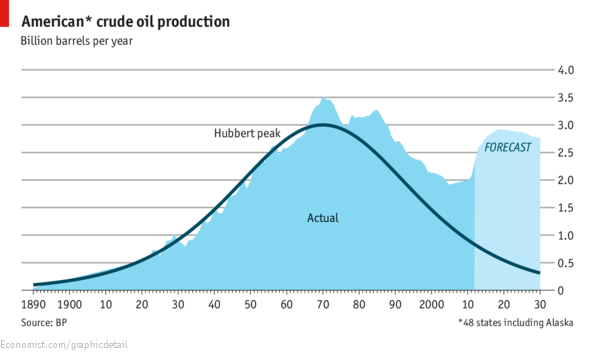 But Mr Hubbert’s curve, which neatly fitted American oil production and rightly predicted a peak in 1970, may need to be redrawn according to analysis by BP, a British oil company. The technology that has unlocked huge volumes of gas from American shale beds can also been used to extract oil. As drilling for oil from shale intensifies America looks set for another peak in the next couple of decades. Mr Hubbert’s curve and the peak-oil brigade look out of date. Enthusiasm for the Dow’s record high looks dangerously frothy given the context of the move. Two weeks ago, I wrote about how six years of 0% interest rates and five iterations of bond buying (taking the monetary base from $800 billion to more than $3 trillion) has been an abject failure in its effort to help working class Americans rebuild. Sure, initial efforts in 2008 and 2009 ended the last bear market and quelled panic. But the Fed’s insistence to keep pushing whenever the stock market catches a cold has resulted in record gas prices, a widening of the inequality between rich and poor, and undercut the ability of seniors to find low-risk investments that will protect them from the ravages of inflation. And it’s resulted in the weakest, most underwhelming economic recovery of the modern era. I care, and I believe most Americans care, more about a near 8% unemployment rate, $4 a gallon gasoline, persistent inflation in housing rents and health care costs, higher taxes, stagnant wages, and the fact that six million fewer Americans are working full-time vs. the 2007 high — even as the population has swelled by 12.3 million over that time. To offer a visual picture of where monetary policy stands at present, the chart below depicts the current situation, as well as data points since 1929. As of last week, the U.S. monetary base stands at a record 18 cents per dollar of nominal GDP. The last time the monetary base reached even 17 cents per dollar of nominal GDP was in the early 1940’s. The Fed did not reverse this with subsequent restraint. Instead, consumer prices nearly doubled by 1952. At present, a normalization of short-term interest rates to even 2% could not be achieved without cutting the Fed’s balance sheet by more than half. Alternatively, the Fed could wait for nominal GDP to double and “catch up” to the present level of base money, which would take about 14 years, assuming 5% nominal GDP growth. Of course, 5% nominal growth would likely make it inappropriate to hold short-term interest rates below 2% for another 14 years. So either the Fed will reverse its present course, or we will experience unacceptable inflation, or we will experience persistently weak growth like Japan has experienced since 1999, when it decided to take Bernanke’s advice to pursue quantitative easing. My guess is that we will experience unacceptable inflation, beginning in the back-half of this decade. Because of the strong relationship between the size of the monetary base (per dollar of nominal GDP) and short-term interest rates, it appears likely that short-term interest rates will be suppressed by Fed policy for some time, until Fed policy normalizes or inflation accelerates. The Fed is now leveraged 55-to-1 against its own capital. With an estimated duration of about 8 years on $3 trillion of bond holdings, every 100 basis point move in long-term interest rates can be expected to alter the value of the Fed’s holdings by about $240 billion – roughly four times the amount of capital reported on the Fed’s consolidated balance sheet.